The recipe presented in this article provides an excellent approach to using leftover chicken. The recipe is also fast, taking approximately fifteen minutes. A quick tip on how to poach skinless, boneless chicken breasts will also be provided. This is particularly useful for those who need to cook chicken in a hurry. An alternative to chicken breasts is store-purchased rotisserie chicken. If you opt for this option, remember that it is salted already. Hence, the dressing should not contain salt. These ingredients would make four servings, with each serving being approximately one and half a cups. Yogurt, mayonnaise, salt and lemon juice are whisked in a large bowl. 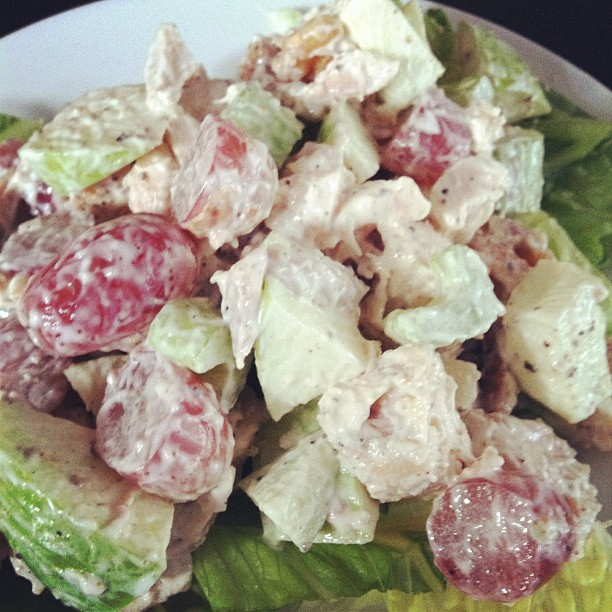 This is followed by adding chicken, celery, half of walnuts, grapes and apples. The meal is then served with a topping of the remaining walnuts. Poaching is the easiest way to cook chicken if you want it cooked in a hurry. The first step is placing skinless and boneless chicken breasts in a saucepan or skillet. This is followed by addition of chicken broth or lightly salted water and then covering to bring to boil. Once it has been covered, heat is reduced to low and simmered gently until the chicken is cooked through. A fully cooked chicken is not pink in the middle, and this is achieved within 10 to 15 minutes.